Some of the children at St Joseph's School in Sierra Leone. AFTER being asked to help out at an African school, a Ponteland woman has decided to stay put and do all she can to help its children. Kate Stoddart went to Sierra Leone in January to do some volunteering work for a micro-finance organisation and was based in the Makeni area. During the trip, she met the people running the St Joseph’s School for the Hearing Impaired, headed by Sister Mary Sweeney from Ireland. Many of the children there have become deaf or hard of hearing through catching malaria or high fever. 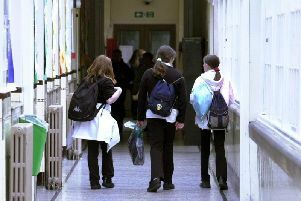 There are 215 students, 79 of whom are boarders and come from the poorest areas of the country. She was asked to provide assistance with the nursery children at first, but then Kate agreed to become the school’s fundraising and communications officer. Its major donor, Caritas, recently pulled its funding for running costs due to a change in focus and now the 24-year-old is hoping individuals, organisations and businesses in the UK will make a donation whilst it develops a new project to help make the school more self sufficient. She said: “I was only supposed to go to Sierra Leone for a little while, but once I spent some time at St Joseph’s I knew I needed to stay because they are desperate for all the help they can get. “Even though they have a condition and are from a poor background, the children are fabulous and they are always smiling. “We receive quite a few donations of equipment, which is great, but we need to cover the costs for heating and food and this has become more urgent now that our main donor has stopped its funding. We don’t receive any help from the government in Sierra Leone because it doesn’t allocate money to special education. “We’re looking to start up a school farm, which could provide us with a sustainable income, but at the moment, we desperately need some donations to keep going and we hope that people and business across the UK and Northumberland will support us. As in many parts of the developing world, children with disabilities in Sierra Leone are often socially marginalised and some are even rejected by their families. St Joseph’s School aims to combat this stigma and enable hearing-impaired children to take their rightful places in society. To help achieve this, the school offers students a rigorous academic education and teaches vocational skills that will allow them to become active members of the working world. It also involves parents in their children’s education and to teach the people of Sierra Leone about the life of the hearing impaired. It strongly believes in the importance of fostering close working relationships between teachers and students and to that end, classes are limited to a maximum of 12 students per teacher. The school uses the Maternal Reflective Method (MRM), which encourages hearing-impaired children to speak instead of relying solely on sign language. Using this approach, a teacher seizes on the bits of language that a child produces, then gives that language back to the child in the form of a full sentence. Through such ‘reflection’, the students gain an understanding of the structure and rules of the language that they are learning. In conjunction with MRM, staff also encourage the students to develop their lip-reading skills, as few people in society will be able to communicate with them via sign language. After getting used to the African weather and culture, Kate is enjoying her new surroundings. She said: “The climate is tough going at times, but it’s a beautiful country and the beaches are fantastic.